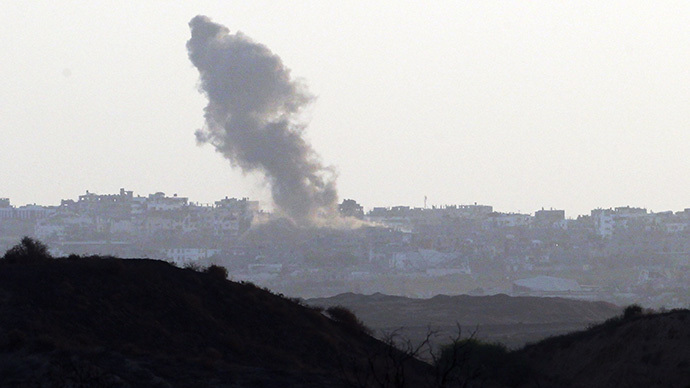 Israeli-Palestinian rocket fire resumed on Tuesday after Gaza truce talks broke down. A 5-year-old girl and a woman became the first victims of renewed Israeli airstrikes in Gaza. Hamas launched around 50 rockets at Israel, hitting as far as Tel Aviv. 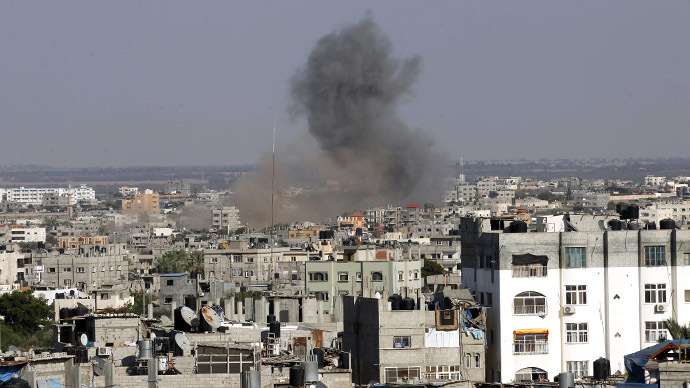 Israel launched at least 35 airstrikes on targets in the Gaza Strip on Tuesday. One of the strikes hit a house in Gaza City, killing a woman and a 5-year-old child, according to Palestinian Health Ministry. Reportedly, one of Israel’s targets was Hamas military leader Mohammed Deif, Israeli Channel 10 said. 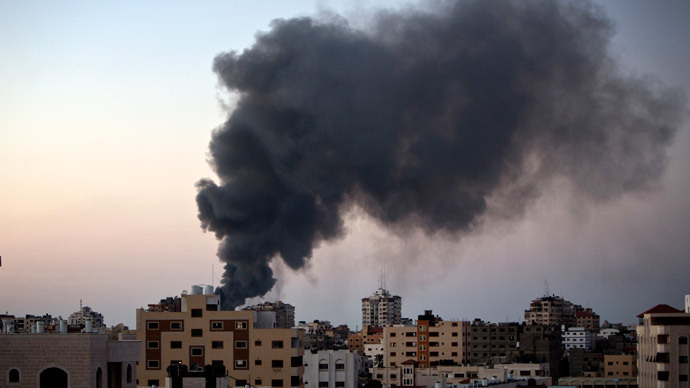 The three people killed during the Israeli airstrikes included a wife and a child of the Hamas military wing's leader Mohammed Deif, AP cited senior Hamas leader Moussa Abu Marzouk as saying. Overall, Israel’s Tuesday airstrikes killed three people and wounded 40 others. Meanwhile, the armed wing of Hamas, the Izz ad-Din al-Qassam Brigades, claimed responsibility for the rockets fired at Israel from the Gaza Strip on Tuesday, including one that hit Tel Aviv Metropolitan Area. Israel confirmed that the rocket landed in an open area, causing no casualties. Hamas threatened to target Israel’s Ben-Gurion Airport near Tel Aviv – the country’s main international airport – and called on all the airlines to stay away from the area. Hamas “has decided to respond to the Israeli aggression” by signaling out the airport as a “target of attack” for the day, Reuters quoted Hamas commander as saying in a statement. Earlier, the group said that it had already launched a rocket at the airport. Israel did not confirm the claim. Twitter users uploaded a photo supposedly showing an intercepted rocket launched from Gaza lying on a road in Tel Aviv. IDF reported that around 50 rockets have been launched at Israel on Tuesday. Israel’s military called on all citizens living as far as 80 kilometers (50 miles) from Gaza border to open up bomb shelters. 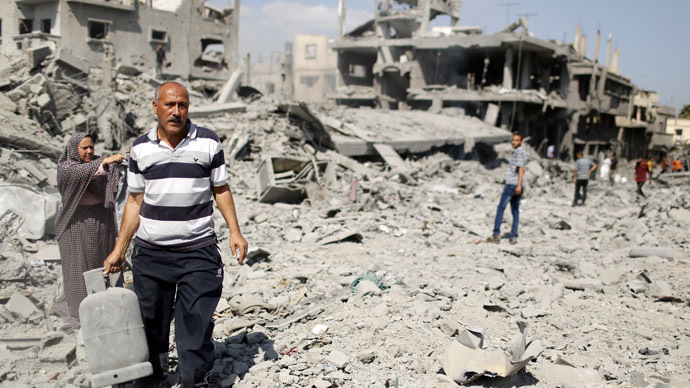 The latest rocket fire marked the first escalation of violence since a truce calmed the fighting around ten days ago. The latest truce was set to expire at 21:00 GMT. 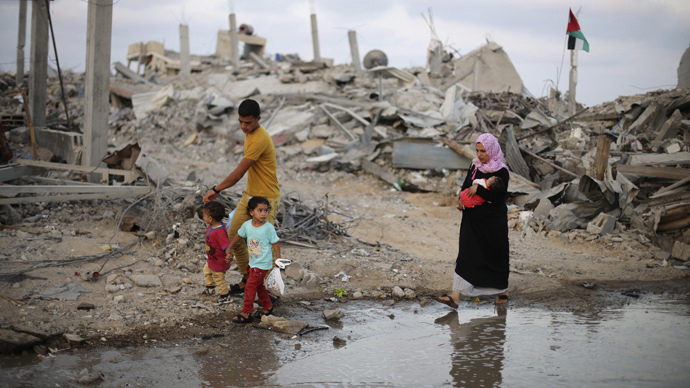 Hamas and Israel have exchanged blame for breaking the truce. “Israel will not enjoy security so long as the Palestinian people do not, and it started it,” senior Hamas official Ezzat al-Rishq said as quoted by AFP. Earlier, Palestinian negotiator Azzam al-Ahmed stated that Israel was responsible for putting an end to ceasefire talks after it recalled its negotiators from Egypt. Israel rejected Palestinian claims that it was the one to blame for the breakdown in ceasefire talks in Cairo. Rocket fire from Gaza “made continuation of talks impossible,” Reuters quoted Prime Minister Benjamin Netanyahu’s spokesperson Mark Regev as saying. “The Cairo process was built on a total and complete cessation of all hostilities and so when rockets were fired from Gaza, not only was it a clear violation of the ceasefire but it also destroyed the premise upon which the talks were based,” Regev said. Israel’s Prime Minister Benjamin Netanyahu has reportedly ordered his negotiators back from Egypt after new rocket strikes between Israel and Gaza took place on Tuesday.